This 10 year old article, republished with permission from ErgoWeb's subscription-based The Ergonomics Report, remains highly relavent today, and the title says it well: Profits, Not Compliance, Will Drive Ergonomics. As the political battle over occupational ergonomics begins to heat up yet again, it’s important to recognize that ergonomics is a ripe business improvement opportunity, not just another compliance worry. As the saying goes, “don’t throw the baby out with the bath water.” In this case, the bath water is dirtied by politicians, opportunists, and business and labor lobbyists with an almost comical misunderstanding of ergonomics, yet an unnerving amount of influence and power. The baby is a potential gold mine of opportunity to improve individual and company performance. Like any other business initiative, persuading management to understand the case for ergonomics is often the biggest hurdle, and making the case in business terms is crucial to success. Properly understood and applied, ergonomics satisfies each of these criteria. 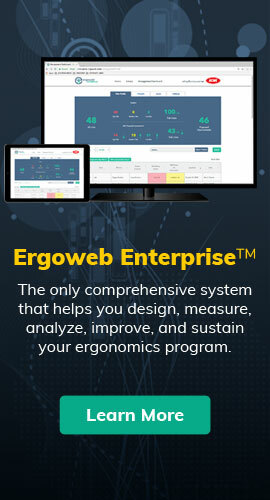 Ergoweb advocates applying ergonomics as a strategy to increase profits. Through informed application of ergonomics principles, not only will your organization increase profits, but it will also satisfy the need to comply and the desire to do the right thing. Ideology aside, profits drive business, and that’s unlikely to change. This past month has seen an interesting assortment of announcements, proclamations, and political posturing that contribute to the mindset of ergonomics as a compliance issue. Also in the news, however, have been several less obvious announcements that clarify the business case for ergonomics. In fact, new data shows that a company that ignores ergonomics is likely to run up quite an unnecessary loss in the process. The trick is to get business to recognize this, and waste less time fretting over if or when workplace ergonomics will be regulated. Injury and cost data released by Liberty Mutual, and new injury incidence data from the Bureau of Labor Statistics (BLS), paint a very clear picture of the losses many businesses experience in the health and safety related ergonomics arena. These data don’t include losses in other business areas, including productivity, quality, waste, process error, and other inefficiencies that result when ergonomics is neglected, but they are substantial enough that they should convince managers with concern for fiscal responsibility and organizational success. Over 577,800 lost-time musculoskeletal disorders (MSDs) were reported in 2000, which accounts for more than one third of all lost-time injuries. About 26 percent of these MSDs occurred in the services industries, 24 percent in manufacturing, and 15 percent in retail trade. Overexertion and repetitive motion exposures resulting in injury caused median days away from work of 7 days and 19 days, respectively. Among the major illnesses and injuries, median days away from work were highest for carpal tunnel syndrome (27 days), fractures (20 days), and amputations (18 days). BLS reports incidence rates only, and does not attempt to tie cost to their data. Liberty Mutual does have detailed cost data, and is kind enough to share it. Using 1999 BLS data, Liberty Mutual estimated the cost burden on industry for the leading causes of recordable workplace injuries. Not surprisingly, injuries that could have been prevented through the application of ergonomics principles are the leading cost categories. The direct cost of workplace injuries (payments to injured workers and their medical care providers) rose 3.6 percent to $40.1 billion in the 2002 Safety Index from $38.7 billion in the 2001 Safety Index. The total financial impact of both direct and indirect costs (lost productivity, overtime, et cetera) is estimated by the 2002 Safety Index to be as much as $240 billion. Looking at the costs of MSDs alone, companies are paying out over $13 billion in direct costs, or as much as $65 billion in actual costs. Companies absorb all of the indirect costs, which managers estimate is between two dollars and five dollars for each one dollar of direct costs of a workplace injury. The financial impact of an injury’s direct cost depends on a company’s specific workers’ compensation program (the level of deductible, self-insurance, et cetera). Each injury’s indirect costs are far larger than its direct costs. Through their 2001 Executive Survey of Workplace Safety, which interviewed 200 business executives from a range of geographic locations, company sizes and industries, Liberty Mutual documented the difference between perceived losses and real losses (see table). The Executive Survey found that executives’ perceptions of which injury causes resulted in the greatest losses were not always accurate. For example, executives reported “Repetitive Motion” is the most important cause of workplace injuries. According to the Safety Index, however, five other injury causes each produced greater direct costs, including the ergonomics-related category of “Overexertion,” which was, by far, the leading cost category. Likewise, executives placed a lower priority on injury causes that actually have greater financial impact. The Executive Survey also queried executives on their perception of workplace safety’s return-on-investment (ROI). Ninety-five percent of business executives reported that workplace safety has a positive impact on a company’s financial performance. Sixty-one percent of the executives indicated their companies received three dollars or more for each one dollar spent improving workplace safety. Interpreting these results, it appears that business executives do in fact recognize that workplace safety initiatives are financially beneficial to companies, but they have misperceptions about what types of injury causes they should focus on in order to produce the greatest ROI. For most companies, focusing on ergonomics will produce the greatest ROI. Also of note this past month was OSHA Administrator John Henshaw’s alliance with the Risk and Insurance Managers Society (RIMS), which occurred at the 40th RIMS Annual meeting in New Orleans. Getting caught up in the politics of ergonomics is very likely to cost you and your organization valuable resources. Looking beyond the battle over policy, wise companies are quietly taking ergonomics to the bank, and you can, too. Taken together, OSHA’s announcement that it will pursue voluntary guidelines rather than a standard, Liberty Mutual’s persuasive cost analysis of injury data, the BLS’s latest injury rate data, and the RIMS-OSHA Alliance all point to the same thing: A lack of concern for ergonomics is resulting in substantial losses to business. Uncertain economic times demand that businesses recognize and pursue cost saving opportunities, and ergonomics is an obvious place to start. Ergonomics will increase profits, will reduce the costs and consequences of compliance and injuries, and it is the right thing to do – for employees, customers, and shareholders alike.